A Google Street View shows the exterior of Kome Japanese Seafood Buffet in Daly City in December. The restaurant has been accused of stealing $5 million in wages from 133 workers. Investigators at California’s Division of Labor Standards Enforcement said Thursday they have cited Bay Area restaurants for more than $10 million in stolen wages. Of the $10 million in alleged wage theft, half comes from wages stolen from 133 workers at a single restaurant, Kome Japanese Seafood Buffet in Daly City. The allegations of wage violations include failure to pay minimum wage and overtime, as well as illegal tip confiscation, the state said. David Leung, an owner of Kome, denies the claim and said he plans to appeal the citation. “Servers are liars, they always want more, they want more money,” Leung said in a phone interview. Leung says the dissatisfaction of the staff started three years ago, when a new owner bought part of the restaurant. Leung would not name the new owner, but a statement of information filed by Leung in November 2016 shows a new corporate secretary, Bai Dong Zhang, and a new chief financial officer, Jun Zheng. The statement also lists Zheng and Yan Lu as directors of the company. Julie Su, the California Labor Commissioner, said the year-long investigation was part of the state enforcement division’s new strategy for dealing with wage theft. “We are choosing to investigate employers who have made a business practice out of not paying workers correctly,” Su said. Wage theft costs California workers up to $2 billion a year. Recent cases that the Division of Labor Standards Enforcement has exposed include a $7 million citation against six residential care facilities in Los Angeles and a $500,000 citation against a Los Angeles restaurant. Su said the most recent investigation in the Bay Area shows how widespread wage theft is. 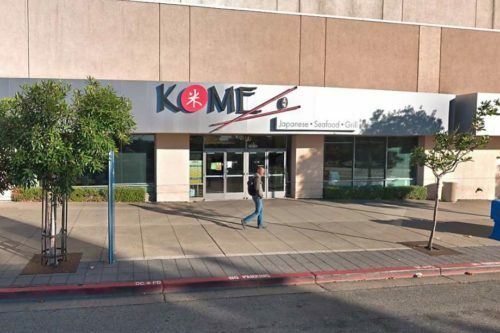 According to the state, Kome owes 133 current and former employees about $5.16 million. All of the workers affected are immigrants, says Shaw San Liu, an organizer for the Chinese Progressive Association, a San Francisco nonprofit hich helped workers organize and formally complain to Kome management. Su said the state could not comment about the workers’ immigration status because it did not ask them. Liu said the workers included Chiu Ping Tam, an immigrant from Hong Kong who spent six years working at Kome and had his tips taken from him; Yuan Ming Gong, who immigrated from Kaiping, China, and said he was terminated after taking an employer-approved vacation for his daughter’s wedding; and Chris Liu, who worked at Kome for 8 years, first as a busboy and now as a server, and said he was paid below minimum wage and was not compensated for overtime. The workers could not immediately be reached for comment. Yelp reviewers note that Kome frequently adds a 15% service charge to bills. Their reviews note some disagreements with servers over whether the charge is a service fee or tip. Leung said his restaurant kept the service charge.